Synthetica V2.10 supports some new UI-properties which allows you to customize the title pane layout for your frames and dialogs. 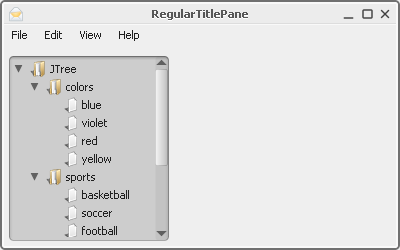 The image below demonstrates a regular title pane with the Simple2D theme. However, for a more modern look you maybe prefer a different layout with a larger icon (menu button) and a slightly different menu bar location. As you maybe know Synthetica provides style support for multiple component instances. So it's possible to use a different layout only for the main screen of your application - other windows are not affected and appear in regular style. An additional synth file contains all necessary declarations of the named default properties. 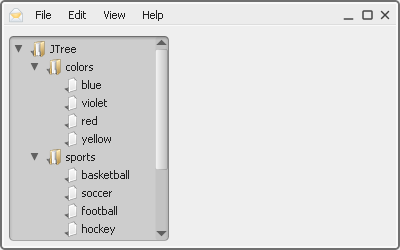 Please note that the window name (LargeTitlePane) is appended to each needed default property. In your application you have to load the additional configuration file through a custom loader just like below. After setting the window name to the configured value the new style appears. Sometimes, when you need as much space as possible for the content area of your application, it's useful to place the menubar on top - in this case the window title disappears. 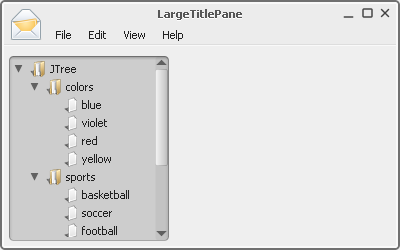 In the screenshot below the slim title pane style (SlimTitlePane) is set. Note: To keep executables as small as possible, the webstart app doesn't includes the Java2D-library SyntheticaBatik - therefore Java 6 is required for proper execution.